Playoff football is coming to Redskin Field for the first time in nine years. That is secured after the Liberal Redskins won their first district title since 2005 when the Skins blanked the Ark City Bulldogs 20-0 Friday night in Ark City. Liberal dominated the line of scrimmage amassing 438 yards while holding the Bulldogs to 102 yards. 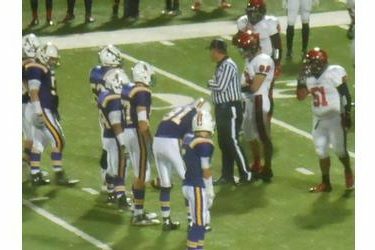 Officials flagged LHS for about 150 yards worth of penalties. Liberal played their best first quarter of the season leading 7-0 at the end of one. LHS quarterback Jared Hasik found Cristian Erives for a 15 yard scored to give LHS a 7-0 lead at the 1:00 minute mark in the fist quarter. Hasik’s pass in traffic was tipped in the endzone to a diving Jared Carroll who made the catch for a first and goal from the one. Hasik’s one yard sneak and the subsequent Carlos Martinez PAT gave Liberal a 14-0 lead with 5:13 remaining before half. LHS tossed an interception in the first half and Liberal’s Juan Rodriguez intercepted an AC pass toward the end of the first half. Ark City recored two LHS fumbles in a scoreless third quarter. Sylman Pando intercepted a pass. Hasik rolled right and found Erives for a 13 yard score to make it 20-0 after Liberal failed to attempt a kick. Rodriguez added his second interception for the game and 11th for the seson. Jared Carroll rushed for 102 yards while Stevie Lira added 60 yards rushing. Hasik passed for 170 yards on 9-18 with two TD’s and one pick. Liberal is 4-5 and wins three in a row for the first time since 2008. They host 7-2 Maize South Friday night at Redsklin Field on 1270 and kscbnews.net.